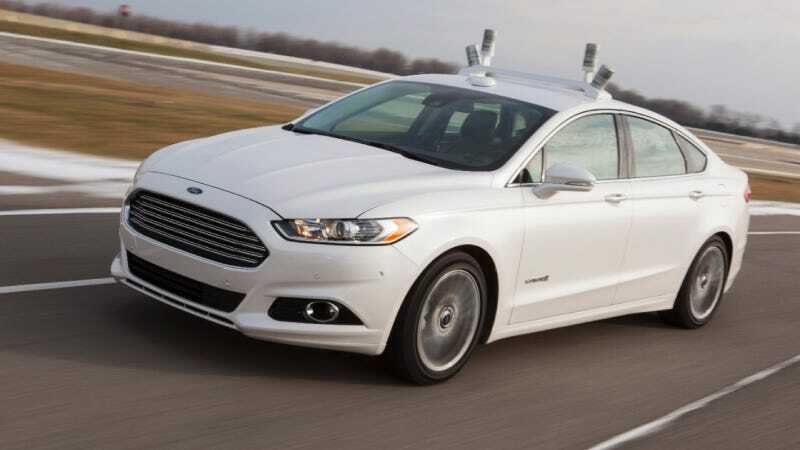 The result of an ongoing project that builds on more than a decade of Ford's automated driving research, the Fusion Hybrid automated vehicle will test current and future sensing systems and driver-assist technologies. Ford's goal is to advance development of new technologies with its supplier partners so these features can be applied to the company's next generation of vehicles. "The Ford Fusion Hybrid automated vehicle represents a vital step toward our vision for the future of mobility," said Ford Executive Chairman Bill Ford. "We see a future of connected cars that communicate with each other and the world around them to make driving safer, ease traffic congestion and sustain the environment. By doing this, Ford is set to have an even greater impact in our next 100 years than we did in our first 100." Today's Ford vehicles already have technology that enables them to park themselves, understand a driver's voice commands, detect dangerous driving situations and assist with emergency braking. With these technologies and others that one day could allow a person to be driven to a destination, the driver always will need to be in control of the wheel if necessary. "In the future, automated driving may well help us improve driver safety and manage issues such as traffic congestion and global gridlock, yet there are still many questions that need to be answered and explored to make it a long-term reality," said Raj Nair, group vice president, Ford global product development. "With the automated Ford Fusion Hybrid research project, our goal is to test the limits of full automation and determine the appropriate levels for near- and mid-term deployment." The automated Fusion Hybrid will serve as the research platform to develop potential solutions for these longer-term societal, legislative and technological issues raised by a future of fully automated vehicles. The Fusion Hybrid research vehicle builds on driver-in-control studies conducted in Ford's VIRTTEX driving simulator. Using VIRTTEX, Ford researchers study how to merge the capabilities of human and automated drivers to create a seamless, integrated experience. Last year at the Mobile World Congress in Barcelona, Bill Ford outlined Ford Motor Company's Blueprint for Mobility – a plan that describes what the automaker believes transportation will look like in 2025 and beyond, and the technologies, business models and partnerships needed to get there. Today, Ford is working on improving technology already used in vehicles on the road. This includes functions that alert drivers to traffic jams and accidents, and technologies for parking and for driving in slow-moving traffic. In the mid-term, vehicle-to-vehicle communications will begin to enter into the mainstream. This will include some autopilot capabilities, such as vehicle "platooning," where vehicles traveling in the same direction sync up their movements to create denser driving patterns. In the longer-term, vehicles will have fully autonomous navigation and parking. They will communicate with each other and the world around them, and become one element of a fully integrated transportation ecosystem. Personal vehicle ownership also will change as new business models develop. The benefits include improved safety, reduced traffic congestion and the ability to achieve major environmental improvements. The Ford Fusion Hybrid was chosen as the test platform for the new research effort because it is among the leaders in offering the most advanced driver-assist technologies in its class. These technologies include Blind Spot Information System, active park assist, lane-departure warning, and adaptive cruise control and collision warning with brake support. These vehicle sensing systems, offered on many Ford vehicles today, are the building blocks for the future of fully automated driving. In North America, these technologies can be found on Ford Focus, C-MAX hybrids, Fusion, Taurus, Escape, Explorer and Flex. In Europe, these technologies are available on Ford C-MAX, Mondeo, S-MAX and Galaxy. "Products such as Ford Fusion Hybrid give us a head start in the development of automated features," said Paul Mascarenas, chief technical officer and vice president, Ford research and innovation. "Our Blueprint for Mobility aligns the desired outcomes of our work in automated functionality with the democratization of driver-assist technology found on today's lineup of Ford products." Ford's Fusion Hybrid research vehicle is unique in that it first uses the same technology found in Ford vehicles in dealer showrooms today, then adds four scanning infrared light sensors – named LiDAR (for Light Detection And Ranging) – that scan the road at 2.5 million times per second. LiDAR uses light in the same way a bat or dolphin uses sound waves, and can bounce infrared light off everything within 200 feet to generate a real-time 3D map of the surrounding environment. The sensors can track anything dense enough to redirect light – whether stationary objects, or moving objects such as vehicles, pedestrians and bicyclists. The sensors are so sensitive they can sense the difference between a paper bag and a small animal at nearly a football field away. Developing the necessary infrastructure to support a sustainable transportation ecosystem will require the collaboration of many partners across multiple industries. State Farm and the University of Michigan's robotics and automation research team are critical to creating the visionary research project. Ford's work with others on the future of mobility is longstanding. Ford was an active participant in the Defense Advanced Research Projects Agency (DARPA)-controlled autonomous vehicle challenges in 2004, 2005 and 2007, the year Ford extended its efforts to include the University of Michigan. While Ford is responsible for developing unique components allowing for the vehicle to function at high levels of automation, the University of Michigan – under the direction of faculty members Ryan Eustice and Edwin Olson – is leading in development of sensor-based technologies. The sensors aid in the logic and virtual decision making necessary to help the vehicle understand its physical surroundings on the road. The university's researchers are processing the trillions of bytes of data collected by the vehicle's sensors, from which they can build a 3D model of the environment around the vehicle. The goal is to help the vehicle – and the driver – make appropriate and safe driving decisions. "This research builds on the University of Michigan's long history of pioneering automotive research with Ford," said Alec Gallimore, associate dean of research and graduate education at the school's College of Engineering. "The unique collaboration will enable Ford to benefit from the university's deep knowledge of robotics and automation, and it will allow University of Michigan faculty and students to work side-by-side with some of the best auto engineers in the world." Meanwhile, State Farm has been working with Ford to assess the impact of driver-assist technologies to determine if the technologies can lower the rate of rear collisions. Last year there were nearly 34,000 fatalities due to traffic accidents in the United States. By developing more intelligent vehicles, Ford helps create smarter drivers. "By teaming up with Ford and the University of Michigan in this research, we are continuing our decades-long commitment to making vehicles, roadways and drivers safer," said State Farm Chairman and CEO Edward Rust. "The changes new technologies bring to our lives are exciting, and we are always looking at how technology can better meet the ever-changing needs of our customers." Today's Ford Fusion Hybrid research vehicle announcement follows an aggressive plan released this week by Business Leaders for Michigan to position the state as the global center for mobility and grow up to 100,000 new jobs in its auto sector by becoming a hub for excellence in advanced powertrain, lightweight and smart/connected transportation technologies. With Bill Ford as champion of Business Leaders for Michigan's mobility initiative, the plan has been developed with a coalition of top industry experts, the Center for Automotive Research and McKinsey & Company. The plan identifies growth strategies for the auto sector as it transitions to an increasingly advanced technology-based sector.